Here’s another intriguing look at Helene, lit by sunlight from the right while some reflected light from its own highlands illuminates the interior of a valley/crater. 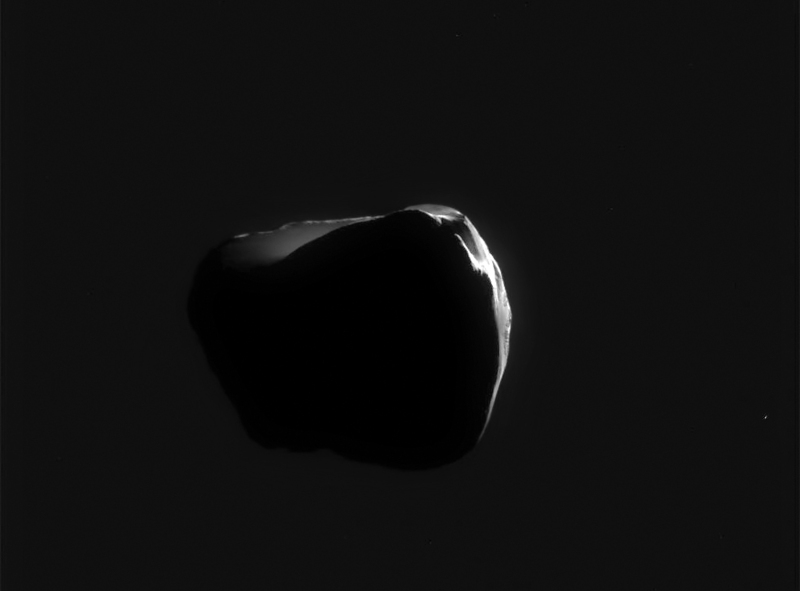 Its dark side appears pitch black against the slightly brighter region of space behind, possibly lightened by the diffuse reflected light from ice particles in Saturn orbit. This is from a raw image acquired by Cassini as it was approaching Helene on June 18, 2011. For more information on that flyby, see my previous post. I brightened the image a bit so it would be more visible on most monitors, and added a layer to give a slight glow effect from the sunlit area. I also had to clean up some CCD noise and artifacting around the edges of the moon. The original downlink can be seen here. Credit: NASA / JPL / SSI. Edited by J. Major.